Questions about iTunes? Ask Macworld senior contributor Kirk McElhearn. He has the answers. It’s time for another grab-bag edition of this column. This week’s questions include one about adding music to an Apple Music library, getting information about all the new releases in a given genre, viewing lots of audiobooks from Audible and the iTunes Store, and more. Q: I have a family subscription to Apple Music. I have some music on CDs that I would like to listen to on my iPhone, music that I can’t find on Apple Music. In the past, I could just rip them on my iMac, and then sync them with my iPhone. I don’t seem to be able to do this since subscribing to Apple Music. How can I get this music on my iPhone? Rip the CDs in iTunes, and make sure iCloud Music Library is turned on in iTunes’ General preferences on the computer where you rip it. It will be synced to the cloud and added to your library, and will be available anywhere, on any devices linked to your account. Check iCloud Music Library on the General preference pane. This makes your entire music library available in the cloud. However, before you turn on iCloud Music Library, you might want to read this and be aware of the problems you may encounter. 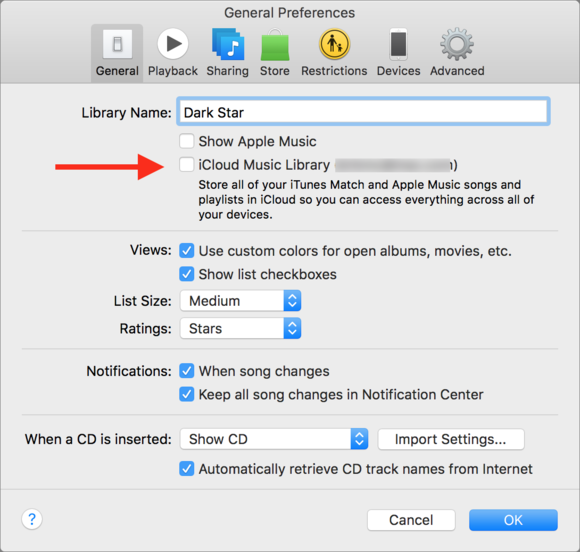 If you have a large, carefully tagged music library, iCloud Music Library can change your tags and artwork, causing a great deal of frustration. Q: I listen to a lot of country music and follow a lot of signed and unsigned artists on social media. Their new albums do not always appear in the “New & Noteworthy” section under the genre; sometimes even major releases don’t always show here. Is it possible to find ALL new releases in the iTunes store by date for a specific Genre? 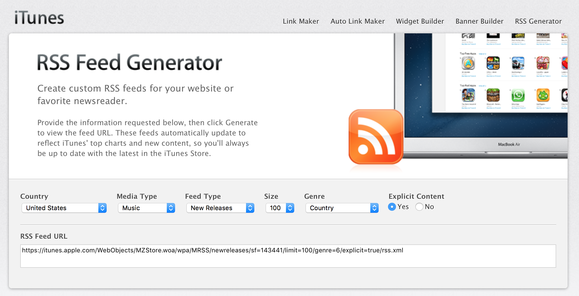 If you use an RSS reader, you can create a specific RSS feed for all releases in a given genre of music on Apple’s RSS Feed Generator page. 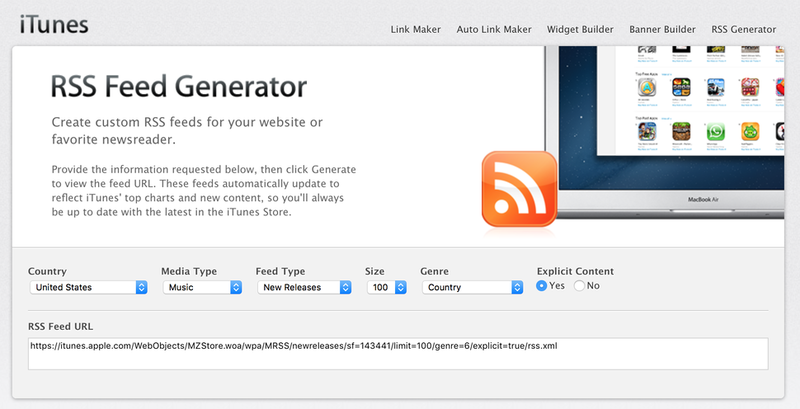 Here’s the interface to set up an RSS feed for the latest releases in country music. These RSS feeds are, however, limited to 100 albums, which might not be enough for you. But try it out and see if it works. You can create feeds for any type of content, for new releases, featured items, top songs/albums/apps, and more. Q: As a long-time audiobook addict, I have a huge collection of audiobooks–several hundred in iTunes and several hundred more in my Audible.com account. I don’t want to download all the Audible books to my computer, because they would take up way too much disk space, but I would like to be able to open iTunes and see all my audiobooks from both locations organized in one place. Is there any way to do this that does not involve actually copying all my Audible books onto my computer? There is no way to do this. What you might want to do, however, is download Audible’s app to your phone or tablet. You can then view your library more easily than on their website. But that won’t let you download the files to iTunes; you’ll still need to go to your desktop computer and access them from your library. This said, you may find that listening on Audible’s app is better, unless you listen to your audiobooks on your computer. And Audible’s app will pick up any audiobooks you’ve synced from iTunes to your device and display them as well. In case you’re not aware, you cannot re-download audiobooks from the iTunes Store. So make sure to keep a backup of all your files, in case something happens to your computer. Q: I have a large playlist that contains 250 songs. I would like to play each song once before it repeats. Is there any way to do this? Alas, no. I’ve often wanted to do something similar, but the only way to do so is to make a smart playlist that looks at play counts, and only plays tracks with a certain play count. For example, if all the tracks in the playlist have a play count of 1, then the smart playlist only plays tracks with a play count of 1. When it’s finished, you edit the smart playlist to play tracks with a play count of 2. And so on. This is certainly something that iTunes should be able to do. It would require a sort of “smart repeat” condition in smart playlists, and I think a lot of people would appreciate that type of feature.